One of the benefits of living in a large city like Philadelphia is never being without myriad options to pass the time. After all, cities are cultural hubs, with goings-on that will satisfy just about any personality type. But when you’re looking at apartments for rent near Dilworth Park, you know you’re really on the right track, since it’s right in the heart of the City of Brotherly Love. Centrally located adjacent the western exterior of City Hall, this multipurpose event space is the perfect spot to kick off any jaunt around the city. Start off with a piping hot coffee from Dilworth Park Cafe for that caffeinated charge to get your day off to an energized start. The park’s market is jam-packed with local vendors selling their specialty items, ranging from art and clothing to festive holiday treats and hand-crafted jewelry. It’s a veritable smorgasbord of gift options that come with the bonus of supporting local artists and vendors. In the warmer months, the giant Great Lawn is the perfect place to gather for a leisurely picnic amid the hustle and bustle of a sprawling metropolis. And if the sun gets to be a little too much, simply seek out one of the four tree groves or run through one of the city’s most popular splash zones, ideal for a bit of respite from the hot summer sun. 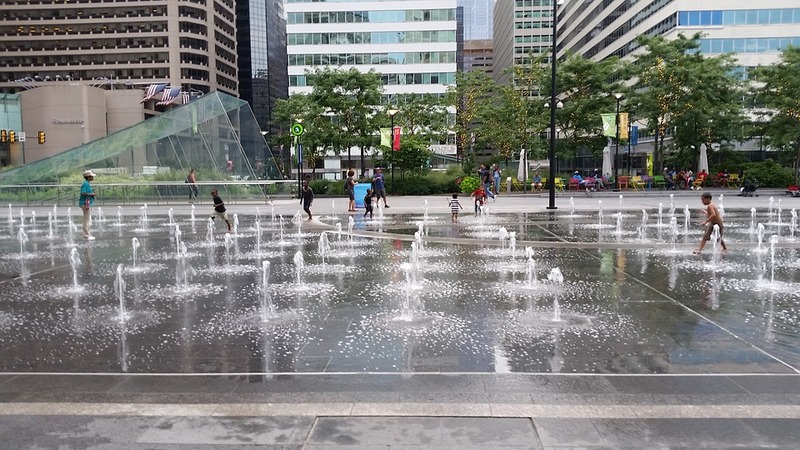 With improved facilities to access the city’s underground public transportation, you’re all set to explore once you sign on to live in one of The Metropolitan apartments for rent near Dilworth Park. There are many reasons to live in Center City Philadelphia—like perusing the food in the Italian markets in South Philly or exploring the historic buildings of Old City—and you can’t ask for a better location to get started. Contact The Metropolitan to visit our amenity-packed one- and two-bedroom apartments near Dilworth Park. Contact us to schedule a tour of our Center City, Philadelphia apartment building that shares space with Philadelphia’s historic skyline. While you walk around our building, you’ll feel at home among the contemporary amenities, including expansive floor plans and ample closet space. While you are here, take some time to explore the neighborhood. Whether you are immersing yourself in the excitement of Reading Terminal Market or the Avenue of the Arts, the Metropolitan and its surrounding area will leave you awestruck. Discover all of what an apartment in Philadelphia’s urban center has to offer. Complete the form below or call our leasing office at 215-854-0729 to schedule a tour. The Metropolitan offers newly renovated studio, 1-bedroom, and 2-bedroom, and 3-bedroom apartment homes for rent in Center City, Philadelphia.